Nottinghamshire have captured the signing of Australian international fast bowler James Pattinson after Peter Siddle was ruled out through injury. Pattinson, who has played 17 Tests taking 70 wickets at 26 apiece, will feature in county cricket for the first time having signed to play four-day and 50-over cricket from the start of the season through to the end of June. 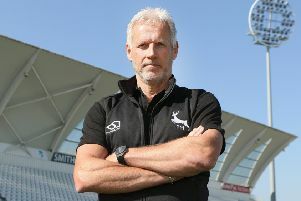 Peter Moores expressed sympathy for Siddle, whose battle with a back injury continues, but believes that – in Pattinson – Nottinghamshire have secured the ideal replacement. “It’s a real shame for Peter,” said the Head Coach. “He’s worked hard to try and get himself fit so for him not to be available, everyone feels for him. “As soon as James became available as a replacement, we knew he was a great option. Pattinson, from Melbourne, has four five wicket hauls to his name in the Test arena, including a debut spell of 5-27 against New Zealand. He has regularly been clocked at speeds in excess of 90-miles-per-hour, boasts a List A bowling average of 28.64 and has featured 19 times for his country in white ball cricket. A teammate of Siddle and Dan Christian with Victoria, Pattinson also has a family connection to Trent Bridge in his brother, Darren, who was a championship winner with Nottinghamshire in 2010. “James has the ability to swing the ball, he hits good lengths and he does it all at a good speed,” added Moores. “Pace creates opportunities, so he gives us a wicket taking option in both championship and 50 over matches. We’ve seen that from him when he’s played international cricket.